C-J's simulation results suggest a 74.6% likelihood the S&P 500 will end 2019 higher than the March close of 2834.40. The median simulation calls for the S&P 500 to increase an additional 7.05% in the last 9 months of the year. C-J also estimates a 14.5% likelihood (1 in 7 chance) the S&P 500 will end 2019 down 5% or more. C-J is a Monte Carlo simulation model used to assess risk in the S&P 500. Traditional stock market models suffer from a number of problems including fat tails, serial correlation, and the failure to account for volatility clustering. The fat-tail problem arises because traditional finance theory uses the normal distribution. For investors, the practical implication of such an approach is that traditional finance theory underestimates (and in some cases significantly underestimates) risk in the market. C-J uses data on valuation, earnings, and short-term historical patterns in the stock market to correct for the problems noted above. C-J does this by using a series of non-normal conditional distributions. If you have read former Yale mathematician Benoit Mandelbrot’s book (with Richard Hudson), The (Mis)behavior of Markets: A Fractal View of Financial Turbulence, then you should note that C-J is fractal by design. And while the model maintains a fractal nature, because of its design it also maintains statistical properties similar to the behavior of the S&P 500 over the last 60+ years. The purpose of C-J is not to provide a single point estimate of where the S&P 500 will be at some future point. As investors we don’t see the underlying process generating movements in the market, we only see the outcomes, thus explaining why “expert” predictions are often wrong. As Nassim Taleb has written in Black Swan, “Most models, of course, attempt to be precisely predictive, and not just descriptive in nature. I find this infuriating”. To that end, C-J is intended to be descriptive in nature by providing not only a model that corrects for the problems discussed above, but does so in a probabilistic manner. For the first three months of 2019, the S&P 500 produced one of the strongest quarters in years, ending March at 2834.40. That is a gain of 13.1%. Back in January, I wrote an article simulating the S&P 500 for 2019. The Index was just coming off a recent dramatic drop that took the Index down to 2351.10 on December 24th. It ended the year at 2506.85. At that point, the recent high of 2940.91, achieved on September 21 st, 2018 seemed like a distant memory. In that article, C-J estimated a 36.8% likelihood the S&P 500 would rise 5% or more in the first quarter and a 16.1% chance the Index would increase by 10% or more. 1. Given the significant increase in the S&P 500 in the first quarter, what is the probability the S&P 500 will increase in the forthcoming quarter(s)? 2. How likely is the S&P 500 to end the quarter(s) above the record high of 2940.41? 3. How likely is the S&P 500 to end the quarter(s) below the low last December of 2351.10? The simulation results for the last three quarters of 2019 are shown below. The results in the table above show the simulation results for the period March 31, 2018 through the end of June 2019. In answer to the three questions. First, C-J estimates a 65.6% probability that the S&P 500 Index will be higher at the end of June 2019 than at the end of March. The median simulation suggests an increase in the Index of 2.38% for the quarter. That would have the S&P 500 ending June at 2910.87. Second, C-J estimates a 40.0% chance the Index will end the second quarter above the 2940.91 record. And finally on the negative end of the distribution, C-J estimates only a 0.5% likelihood the Index will end June below the 2351.10 low. But noteworthy on this end of the distribution is that the simulation results suggest a 9.9% likelihood that the Index will end June down 5% or more. All things considered, the simulation results point to a positive second quarter. The results of the simulations through the third quarter of 2019 provide a more mixed set of results. 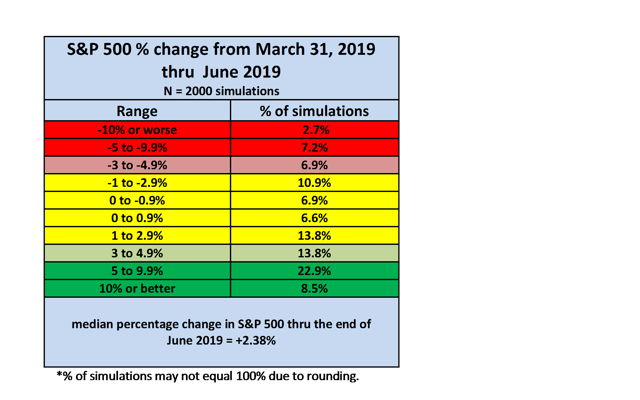 On the one hand, the simulation results estimate a 48.8% likelihood the S&P 500 will increase by 5% or more from the end of March through the end of September. The median simulation in this case suggests an increase of 4.8%, a result that would put the S&P 500 at 2969.96 by the end of the third quarter. Expanding on these results further, the results also suggest a 55.2% likelihood that the third quarter will end with the Index above the 2940.91 record. In contrast, and in answer to the third question, C-J estimates a 12.7% likelihood the Index will be down 5% or more over the next two quarters. But to go along with that C-J only estimates a 1.4% chance the Index will end September below the 2351.10 low established last December. All of this suggests that the next six months generally look good and, should the market decline, the likelihood of the market ending September in a deep decline is relatively low. So how will the year end? C-J estimates a 74.6% likelihood the remainder of the year will be positive with a median increase in the Index of 7.05%. That result would mean the S&P 500 ended 2019 at 3034.28 – a level for the Index that analysts have not been talking since the early part of 2018. Furthermore, C-J estimates a 63.2% likelihood the year ends with the S&P 500 at a new record level. And finally, in answer to the third of my questions, C-J estimates a 3.0% likelihood that the Index will end the year below 2351.10. To elaborate on that further, and as a caution against becoming overly optimistic about the above results, C-J estimates a 14.5% likelihood (about 1 in 7) that the Index will end the year down 5% or more. A 5% decline would have the S&P 500 ending 2019 at 2692.68, a decline of about 142 points over the next nine months and have the Index back at a level last seen in January 2019. Additional disclosure: I own a long position in an S&P 500 Index fund in a retirement account. Disclaimer: This article contains model-based projections that are forward-looking and, as with any quantitative model, are subject to uncertainties and modeling assumptions. The C-J model is intended as a tool to assess risk in the S&P 500, and not as a forecast of the future value of the S&P 500 or any other market. The results of C-J are for informational purposes only. Nothing in this article should be construed as specific investment advice.